Sunny and warm this morning, currently 69˚F, with a projected high of 70˚F. I think we'll beat that. Yesterday, I wrote 878 words, "F is for Fruiting Bodies (also Fungophobia)." I'd intended to write "Fleur-de-lys Building," but it felt a little dry. 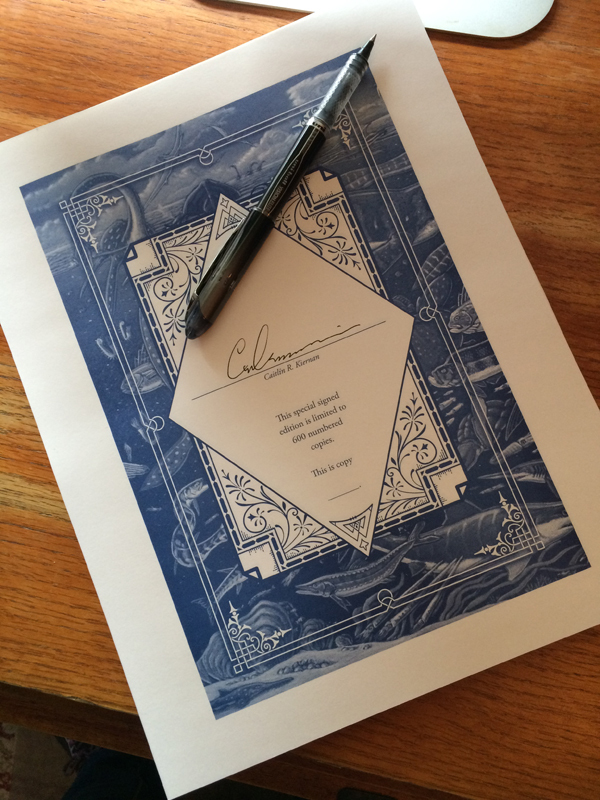 And then I worked on the signature sheets for The Dinosaur Tourist. I'd meant to finish them yesterday, but after two hours my hand was cramping and my back hurting and I was still only a little better than halfway done. So, I'll finish that today. I didn't get any packing done yesterday. Spooky met her mom in Warwick and shopped for new sneakers. Last night, a new episode of Archer, and we finally began watching Downton Abbey. I liked the first episode. Thank you for the reminder to pre-order! And Spooky's right: those ARE beautiful signature pages. I'm so glad I Pre-Ordered as soon as it went up on the Subterranean website. Yes!! !